By now you all know how very much I love Sheet Pan Meals. It makes for delicious dinners and easy clean-up and that’s always a win win for me. This was very easy to assemble and cooks in under an hour. Oven to Table in under an hour is my kind of meal. Of course you can substitute other veggies if you don’t like peppers. I finally got Joel to eat cooked peppers and onions and I try to use them as often as possible. It’s amazing to me that it took him this long to start to enjoy vegetables but I couldn’t be happier. He also eats Brussel Sprouts as well! I think Brussels would be good here as well as Broccoli ( but he won’t eat Broccoli) . I served over Brown Rice and it was just perfect. I used 1 Tablespoon of Sriracha which gives it a little hint of spicy. I wouldn’t omit it because all the flavor of this recipe is in the honey/chili combo. You can put a little less Sriracha if you like. In a bowl , whisk the ingredients for the sauce and set aside. Season the chicken with salt and pepper and place 1/3 of the sauce in a gallon size plastic bag and add the chicken. Squish around the sauce till it’s all over the chicken and place in fridge for about 30 minutes or longer. Cut up the veggies and place in a bowl. Pour 1 Tablespoon of Olive Oil over the vegetables. It’s a little oil for a lot of vegetables but it works. You’ll be using the sauce on the veggies. After 30 minutes–transfer the chicken to the sheet pan and roast just the chicken for about 15 minutes. After 15 minutes remove the chicken from the oven and arrange veggies around the chicken (see photo). Drizzle the remainder of the sauce over the vegetables and the chicken. Mix with a spoon. Return to oven and bake for about another 15 minutes, my chicken was done at this point because I had smallish thighs . I removed the chicken placed on a plate and covered with aluminum foil. I continued cooking the veggies for another 10 minutes because I like them cooked well. When veggies were done to my liking I removed from the oven and added chicken to hot baking sheet and mixed veggies up with a spoon over the chicken. I served over rice, quinoa or anything you’d like. *You will have to experiment with cooking times for veggies and chicken depending on the size of your chicken thighs and your oven. This is an easy and healthy sheet pan meal with honey balsamic chicken and brussels sprouts ready in 1/2 hour!!!!! My kind of meal every day of the week . It was so super easy and ingredients were minimal . I stopped and picked up chicken and brussels sprouts and I had all the other ingredients in the house. I asked the butcher at Whole Foods to pound the chicken breasts so they would cook quickly and it was truly perfect. I served over Brown Rice but this is totally optional. Easy Peasy Healthy and Easy that’s how I like it. Preheat oven to 400 degrees. Ask Butcher to pound chicken breasts to even thickness and less than 1 inch thick. Combine chicken and brussels in a large bowl, drizzle with olive oil and toss to coat. 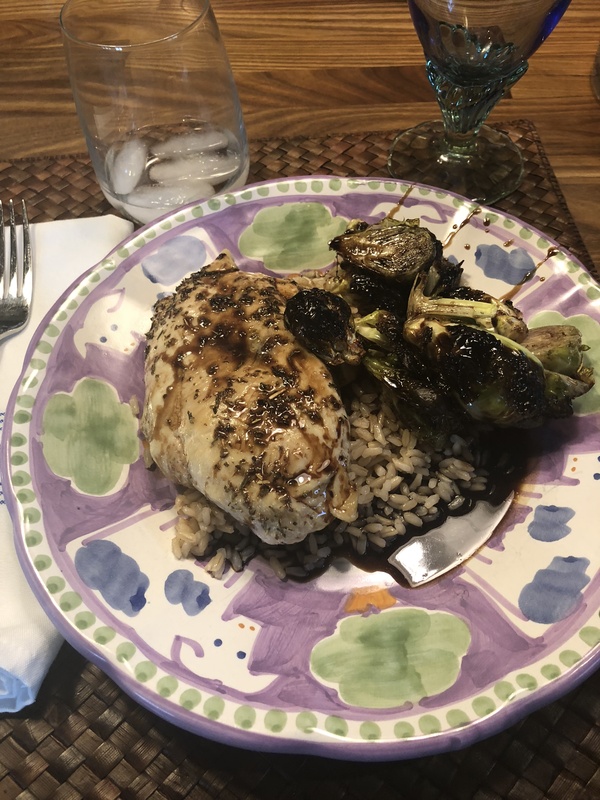 Arrange chicken and brussels sprouts on a sprayed sheet pan ( Pam). Season with italian seasonings and salt and pepper. Transfer to oven and bake for 15 minutes or until chicken is cooked through and brussels are almost fork tender. I cooked for 15 minutes. Add balsamic vinegar to a medium sauce pan. Bring to a boil over medium-high heat and boil for app. 6-8 minutes until reduced to half the original volume. Remove from the heat and stir in the honey, garlic powder, and salt. Allow the sauce to cool while the chicken finishes cooking. After Chicken and Brussels have baked for about 15 minutes, switch to broil for app. 2-4 minutes . Be careful not to burn up brussels sprouts, just check on it after 2 minutes and then again. Remove chicken sheet pan from oven, drizzle with the balsamic glaze and a little cracked black pepper and serve. I served over rice and it was just perfect. *This should serve 3-4 people nicely especially with the rice. This is an easy and healthy sheet pan meal with honey balsamic chicken and brussels sprouts ready in 1/2 hour!!!!! My kind of meal every day of the week . It was so super easy and ingredients were minimal . I stopped and picked up chicken and brussels sprouts and I had all the other ingredients in the house. I asked the butcher at Whole Foods to pound the chicken breasts so they would cook quickly and it was truly perfect. I served over rice but if you’re really watching your waistline after the holidays you can omit it . Easy Peasy , Healthy and Delicious that’s how I like it.